Here are some words of wisdom from last year’s Library Work-Study, Jaye Fishel, who spent her tenure working to promote and display the Banff Centre’s insane collection of artists’ books. Jaye kindly answered my questions about being an American book-nerd in Alberta, the projects she worked on, and the application procedures to get into one of Canada’s prettiest cultural institutions. ArLiSNAP: Can you start with a bit of your background? Jaye Fishel: I was an artist before I got my MLIS degree, which I in-part pursued to professionalize my interest in artists’ books in particular. I worked in the rare books library during my undergraduate studies (at Emory University) and was introduced to artists’ books in processing collections. That led me to move to San Francisco in 2005 to study at the Center for the Book there, where I learned letterpress printing and other techniques. Since then, I’ve expanded my artistic repertoire but books and works on paper still figure largely into what I’m interested in engaging with, both professionally and as an artist. ArLiSNAP: What were you doing previous to taking the work-study position? JF: I was living in Oakland, unable to find a professional position suitable for me. I only realized after graduating with my MLIS that any job, let alone a job dealing with artists’ books, was very difficult to come by. ArLiSNAP: What was the application process like? JF: The application process was straightforward — I submitted a project proposal in addition to a standard cover letter that outlined a project I would produce while at the Centre. Since the work-study position is an educational program, like an internship, I stated some learning objectives. Applying to work in Canada from the US seemed to have little bearing on the application process, although once I accepted the position, I had to secure a student visa, which did not show up until the day before my flight to Banff, causing more than a little anxiety. JF: I needed a student visa because the work-study program is considered an educational program, so technically I was a student in the eyes of the Canadian government. Work-study participants receive a stipend, not a salary, and are generally treated differently than staff at the Centre. ArLiSNAP: What attracted you to the position? JF: The job description was like a dream! Working fairly exclusively with the artists’-books collection in an international art residency centre? I was attracted to everything about that. Plus, I needed a change in my life, so I felt ready to move to remote Banff from the Bay Area, which was changing rapidly before my eyes into a place that felt less and less accommodating to artists and craftspeople. I was also attracted to the adventure. ArLiSNAP: What period of time were you there? What was it like moving to Banff and settling in? JF: I arrived in Mid-May and I left at the end of February, so I was there for nine months. It was an adventure the entire time — living in the middle of the Canadian Rockies in an art residency center was unlike my life in the Bay. I hadn’t lived through a snowy winter since I was a child, so that was definitely an adjustment, as was living in a very small tourist town. I had a sometimes quiet, simple existence — sometimes filled with lots of art and parties and people from all over the world. ArLiSNAP: What was a typical work day like? JF: I worked four days a week, nine to five, with one day away from the library to work on outside research or projects. Typical days usually included working on artists’-book catalog records, planning upcoming events, and working with patrons. Then I’d walk home and see at least one deer or elk, on average. ArLiSNAP: You started a few neat initiatives while you were there. Can you tell us about getting those programs going? I had wonderful support from my mentor, Suzanne Rackover, to do whatever I wanted with my time to enhance use of the collections. So I just came to her with my ideas and she supported my process. For the artists’ books showcases, I would loosely try to pull items that would be of interest to visual artists on residencies. I would make sort of weird promotional fliers and hand them out and post around campus. Setting up the Tumblr project required simply creating a randomized spreadsheet of the collection, creating the new display every Monday of fifteen items, photographing the works, and posting to the Tumblr. It’s a fairly simple process, so now almost anyone who works in the library can continue the weekly changes. 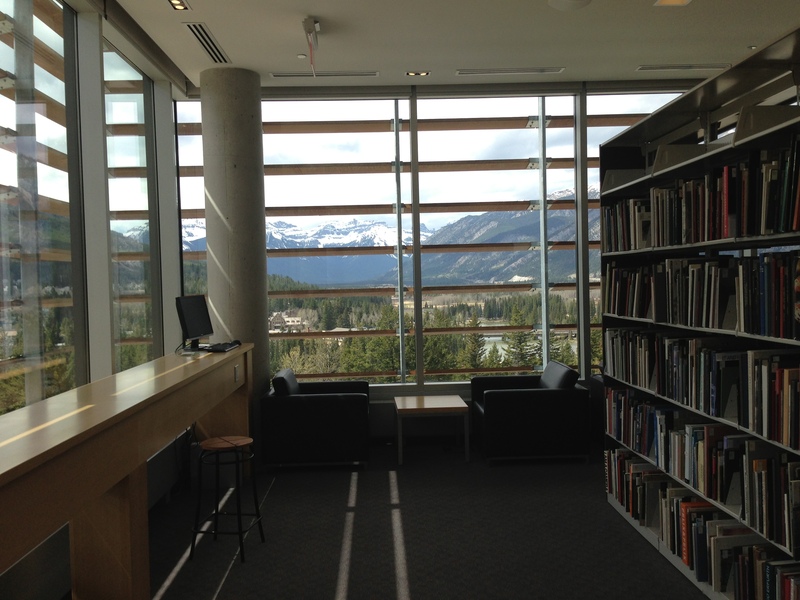 ArLiSNAP: Do you have any advice for someone looking to apply to the Banff Centre Library, or things to do while working there? 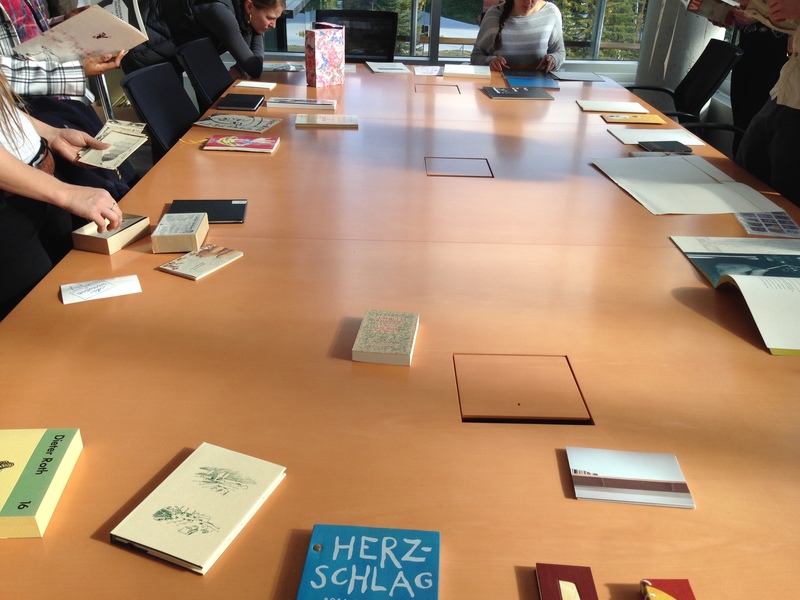 JF: I’d advise anyone interested in working with an outstanding artists’ books collection to apply. It is truly an amazing collection that I feel so lucky to have worked with every day. I know I’m a great deal more knowledgeable about artists’ books than I was before working at the Centre. Working at The Banff Centre is very special because artists across media from around the world come to make and show work. I encourage any future library work study to go to every show, performance, artist talk, party, dinner, bingo night, hike, and outing possible. There is a lot to experience in a very short time. Applications for the Library Work-Study are due on June 15th!